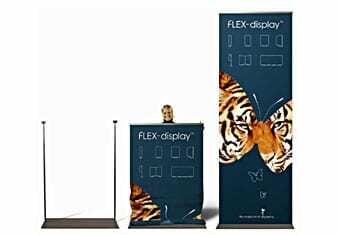 Flex display stands can be used to display graphics that are less than the standard height of 2m and they can also be used to display graphics that are taller than the standard 2m height. 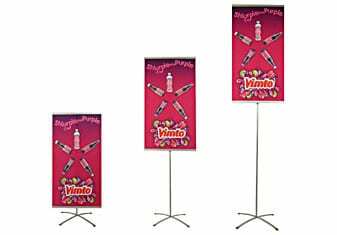 As the bottom clips on all of our systems may be positioned anywhere on the vertical pole, this means that full height graphics do not need to be used on every occasion. 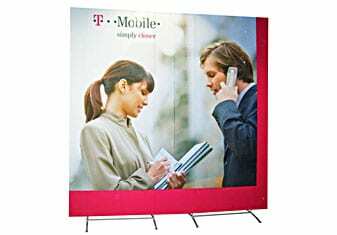 So this feature allows the Flex display system to display fabric posters as well as larger fabric graphics – In fact, you choose the height and the system will happily display it. See Pole Types for further info. Where a fixed pole height of 2.25m is required we have a simple 20cm extension pole to do this.